Preheat your oven to 275 degrees F. Cut an X across the bottom of the tomatoes and place in boiling water. Blanch the tomatoes in a pot of boiling water until the skins loosen. Add the tomatoes to the ice water using a spoon. Once the tomatoes are cool enough to touch, drain the water and peel. Pat the tomatoes dry and then half crosswise. Add the tomatoes (cut side up) to a non-stick baking sheet. Drizzle them with about 2 tablespoons of olive oil and sprinkle with the thyme, some salt and pepper. Roast the tomatoes for 2-1/2 hours or until the tomatoes are slightly smaller and very tender. Add the tomatoes to a plate for cooling. Evenly spread the brioche cubes on a baking sheet. Toast until crispy and golden, about 15 minutes and let cool. Mix the mayo, crème fraiche (or sour cream), and buttermilk together until smooth. Add the lemon juice, parsley, mint, and a tablespoon of chives to the mix. Season the dressing with salt and pepper and refrigerate until cold. Cook the bacon over moderate heat in a skillet. Be sure to stir the bacon around occasionally until browned and crisp. Remove the bacon from the pan and then let drain on a paper towel. 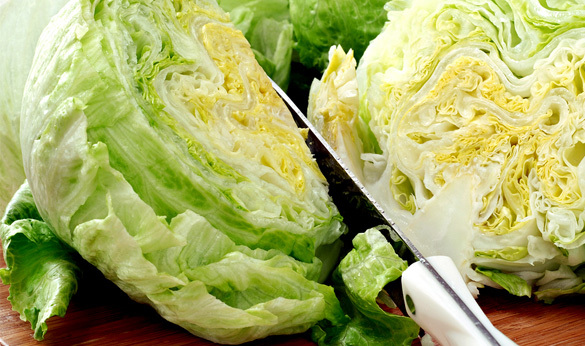 Arrange the wedges of iceberg lettuce on a plate or platter and add a tomato half for each wedge. Drizzle with 2 tablespoons of olive oil. Sprinkle the bacon and croutons over top of the wedges. Feel free to garnish with the last 2 tablespoons of chives for a great presentation. Serve wedge salad with your homemade dressing on the side.